Happiness is a town called Harrogate – and that’s official. The town has beaten the likes of York and Shrewsbury and, even, London to be named the happiest place to live in the entire country. Being located in the heart of ‘God’s County’, this happy bit of recognition shouldn’t come as a complete surprise, not to a town which can boast The Stray, Bettys and Valley Gardens among its crown jewels. Anyone who lives here knows exactly how great Harrogate and its fabulous lifestyle is. But to receive the accolade for the third year running is unprecedented and truly remarkable. Even the man behind the Grand Depart triumph at last year’s Tour de France, Sir Gary Verity, is impressed. Rightmove’s Happy At Home Index asked residents to rank a number of factors in their home and community. Harrogate was rated high in terms of general upkeep of the town, safety and being proud of where people lived. Celebrating the town’s success, Mike Newby, director of Visit Harrogate, who was regarded as one of the town’s happiest ever mayors, said: “To come top two years running was great but to be named the happiest place for a third time is amazing. The 12 factors which went towards the final results ranged from contentment and pride to value and neighbourliness. Harrogate proved strong in most categories, edging out Chester, Ipswich, Shrewsbury and York in the top five positions. Two key points in creating Harrogate’s success were recreation and amenities, two areas in which Harrogate Borough Council can claim to be national leaders. Mayor of the borough of Harrogate, Coun Nigel Simms, said: “I am delighted that Harrogate has been recognised in this way for the third year running but I am not surprised as Harrogate has a lot to offer with outstanding schools and a safe community. Coun Richard Cooper, council leader, hailed the town’s fantastic shopping, plentiful restaurants and cafes and great entertainment and leisure opportunities. But he also highlighted its affluence and thriving economic sector. He said: “Harrogate is a fantastic part of the world to live in. Residents benefit from a great quality of life with low unemployment, low crime, excellent local services, on-going investment, highly regarded schooling and great community spirit. Every success comes at a price, however. The Happy at Home survey’s organisers at Rightmove, point out that property asking prices are higher than the national average. 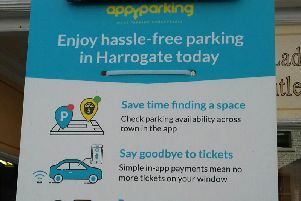 It’s a price which seems inevitable, given the attractive nature of Harrogate. Rightmove may have gone a bit too far on one thing, however. That may be a step too far if it makes us even happier, who knows? Who do you think is the happiest person in Harrogate? Someone well known, or someone in your family? Sir Gary Verity has given his vote of happiest Harrogate person to a former mayor, and now chief executive of Visit Harrogate, Mike Newby.